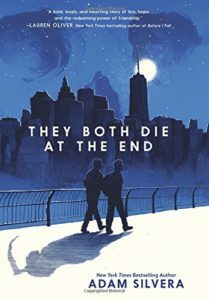 They Both Die at the End is a book that tackles friendship, the mortality of life, and truly living in the moment. It is a book that has so many different elements to hook readers – family, love, friendship, self-discovery. Having read History is All You Left Me and loving the characters Silvera creates, I was expecting to adore the characters. And, yes I did. But what really kept me hooked is how Silvera plays with this question, “can we be someone else, the person we always wanted to be, when faced with the immediacy of our own mortality?” What a question. Because that’s essentially how it starts with two boys looking to find a sliver of connection on their End Day, but also to find the courage to be someone they always wanted to be – whether that be because of a mistake they made, or the fear of danger. And that’s not where Silvera ends. Because They Both Die at the End tackles coming out, saying goodbye, friendships that can bring out the best in you, and the necessity to embrace life. I listened to this book on audiobook, and you can tell I really love a book when I just end up listening to the book while sitting on the couch. Normally I listen to audiobooks while walking or doing chores, but this one forced me to finish the chapters and as the book rose in crescendo, it forced me to finish. A really unique touch that Silvera incorporates, are glimpses into other people’s lives, small chapters of bystanders, or side characters. They aren’t enough to make them a constant feature normally, but it’s just a testament to how our actions effect others. How the person we brush by on the sidewalk’s day is changed. Or even how the people who we admire deal with their own End Day. So in all, History is All You Left Me convinced me that I adored Silvera’s characters, but They Both Die at the End convinced me of Silvera’s writing talent. It’s not only about characters that pull at your heart strings, that’s surely a large part of my enjoyment. But it’s also about little touches that come together, pieces of puzzles that click into place. Find They Both Die at the End on Goodreads, Amazon, Indiebound & The Book Depository.